This course shows you how and why you are missing evidence using Windows-based tools and how to find what is missed by using a Mac to process a Mac and is part of the IACIS training in Orlando, Florida. This course was developed to provide vendor neutral and tool agnostic training that covers the process of examining a Macintosh computer from the first step to the last step in logical order. The course was designed for both the beginner Mac examiner as well as the advanced. 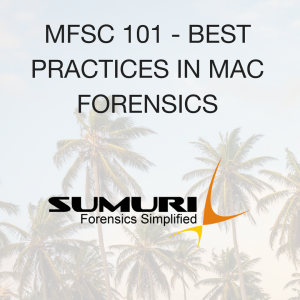 Surprising to most is that the entire course is taught using a Mac to examine a Mac without the use of expensive automated forensic tools. Even more surprising is that the participants realize that they can find more evidence and find it faster! Additionally, this course was designed with the understanding that many agencies are dealing with limited budgets.